Take a V-Slicer or any fine shredder. Wash and clean the tomatoes. Shred the tomatoes and keep them aside. Wash, clean and break the green chilies into small pieces and keep them aside. Similarly break red chilies into small pieces. Heat a pan and add oil to it. When the oil is hot add the fenugreek seeds and black gram. Fry the seeds till they change color to light golden brown. Then add the mustard seeds and fry till they crackle. 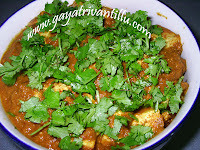 Now add the green chili pieces, red chili pieces and asafoetida and fry till the green chilies change color. Green chilies when fried in oil will not be hot. Remove the seasoning, without oil, from the pan and keep it aside. To the remaining oil add the tomato shreds. Add salt and turmeric powder to the tomatoes and mix well. Cook covered for 5 minutes. After 5 minutes, remove the lid and cook for 3 to 4 minutes. Separate the cooked tomato shreds from the juice oozed out, with the help of the slotted ladle and cool them. Now grind the ingredients to prepare the Pachhadi. For grinding one can use a mixer grinder or a Mortar & Pestle. Take the fried seasoning ingredients into a mixie jar and grind them by adding the juice of the tomatoes to a paste which should neither be too fine nor too grainy. If required add some cooked tomato pieces and grind, for smooth running of the mixie. Then whip the cooked tomato shreds so that they do not become a paste. Now mix the ground tomatoes with the ground seasoning ingredients. Add half of coriander leaves and mix well. Transfer to a serving bowl and garnish with the remaining coriander leaves. Serve with hot rice. First separate the fried green chilies, fried red chilies from the seasoning. Take the seeds into the mortar and grind them to a coarse paste as shown in the movie clip. It will take a few minutes before the job is done to the required texture. Use a spoon to bring the ground ingredients to the centre of the mortar. Now add the fried red chilies and crush them. Then add the fried green chilies and crush them to a paste. Take care while grinding the chilies as the seeds of the chilies fly and may land in your eyes. See the movie clip to test the texture of the ground seasoning. Now add the cooked tomato shreds and grind slowly. Then add half of the coriander leaves taken and crush them lightly to give a nice flavor to the pachhadi. Now add the cooked juice of the tomatoes and mix well. Transfer this pachhadi to a serving bowl and garnish with the remaining chopped coriander leaves. Serve this tomato pachhadi with hot rice. This pachhadi tastes good with dosa, Idli, pesarattu, utappam and hot rice. Spread this pachhadi on a roti or paratha, roll and serve. It tastes good even in curd rice. There are two types of tomatoes available in the market. One is the country (Desi) variety and the other Hybrid variety. Desi variety tomatoes are orange in color—raw ones are light green in color, whereas the hybrid variety tomatoes are red in color. The Desi ones will taste sourer when compared with the hybrid ones. Fenugreek seeds are used to balance this sourness. So use 1/2tsp fenugreek seeds when using Desi variety tomatoes and use 1/4tsp fenugreek seeds when using Hybrid variety tomatoes. Similarly, depending on the sourness of tomatoes, increase or decrease the quantity of green chilies. The taste of this pachhadi differs slightly when ground in a mixer grinder and a Mortar & Pestle. Both ways it tastes good. If using a Mortar & Pestle, it will be a good exercise for the person preparing this pachhadi. gayathri garu nenu newly married. after mrj nenu ma varu pune lo vuntunam. mi﻿ vanta naku chala baga use avuthunai. ma mom ekada leni lotu miru thirusthunaru. specially miru explain paddathi. thank u so much madam. 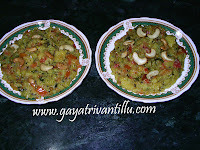 Thanks Gayatri Garu..It﻿ came out very well...Too tasty..